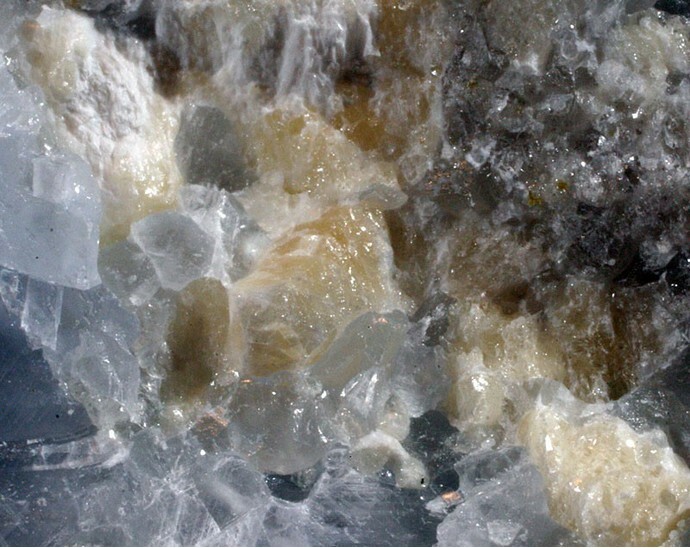 Hydroxylellestadite: Mineral information, data and localities. Ellestadite (sensu lacto) was first described and named in honor of Dr. Ruben B. Ellestad (1900-1993), American analytical chemist of Minneapolis. Based on the chemical analysis, the type specimen of ellestadite should be considered a hydroxylellestadite (Pasero et al. 2010). Later Harada et al. (1971) described hydroxylellestadite. It was renamed as ellestadite-(OH), and again, by IMA 2010 (Pasero et al. 2010) back to hydroxylellestadite. The crystal structure was refined, first by Sudarsanan (1980), Hughes & Drexler (1991) and later by Onac et al. (2006). A mineral in the Ellestadite Group of the Apatite Supergroup. 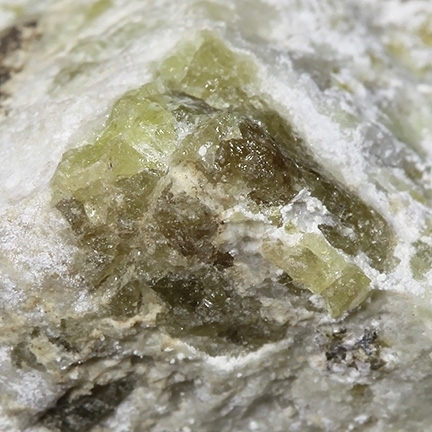 Fluorellestadite-Hydroxylellestadite Series; Hydroxylapatite-hydroxylellestadite series. The hydroxyl analogue of fluorellestadite. It is found in pegmatite veins, skarn and pyrometamorphic deposits. Sulfate may be substituted by carbonate, at least in part, to give Unnamed (CO3 analogue of hydroxylellestadite) if the 50% rule is met. 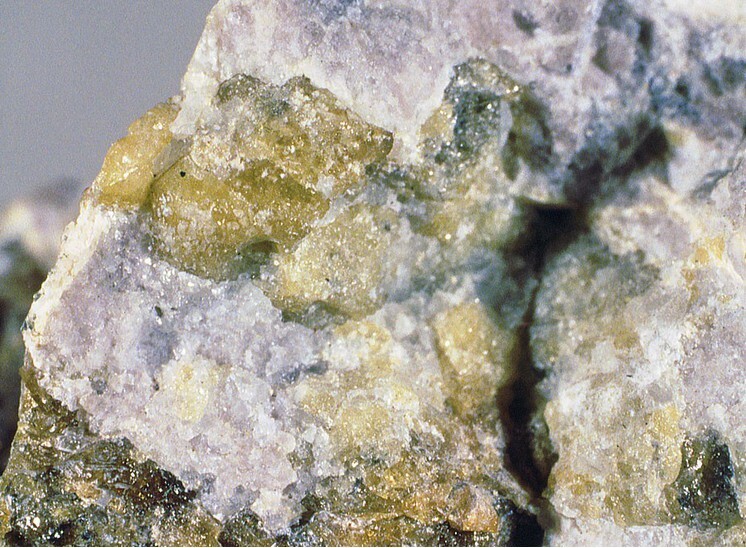 Ye'elimite 1 photo of Hydroxylellestadite associated with Ye'elimite on mindat.org. Plombièrite 1 photo of Hydroxylellestadite associated with Plombièrite on mindat.org. Harda, K., Nagashima, K., Nakao, K., Kato, A. (1971) Hydroxylellestadite, a new apatite from Chichibu Mine, Saitama Prefecture, Japan. American Mineralogist: 56: 1507-1518. Hughes, J.M., Drexler, J.W. (1991) Cation substitution in the apatite tetrahedral site: crystal structures of type hydroxylellestadite and type fermorite. Neues Jahrbuch für Mineralogie, Monatshefte: 1991: 327-336. Onac, B.P., Effenberger, H., Ettinger, K., Panzaru, S.C. (2006) Hydroxylellestadite from Cioclovina Cave (Romania): microanalytical, structural, and vibrational spectroscopy data. American Mineralogist: 91: 1927-1931. Hughes, J.M., Rakovan, J.F. (2015) Structurally robust, chemically diverse: Apatite and apatite supergroup minerals. Elements: 11(3): 165-170. Лицарев М.А. и др. Гидроксилэллестадит из гранат-волластонитовых скарнов Аримао-Норте (Куба), //Записки ВМО, 1998, N6, c.68-75. ; Chukanov, N. V. (2013). Infrared spectra of mineral species: extended library. Springer Science & Business Media. ; Zateeva, S. N., Sokol, E. V., & Sharygin, V. V. (2007). Specificity of pyrometamorphic minerals of the ellestadite group. Geology of Ore Deposits, 49(8), 792-805.; Litsarev, M. A., Organova, N. I., Khranach, P., Chukanov, N. V., Kuz’mina, O. V., Kartashov, P. M., ... & Zadov, A. E. (1998). Hydroxylellestadite from the Arimao Norte Garnet–Wollastonite Skarn (Cuba). Zap. Vseross. Mineral. O–va, 127(6), 68-75. Harda, K., Nagashima, K., Nakao, K., Kato, A. (1971) Hydroxylellestadite, a new apatite from Chichibu Mine, Saitama Prefecture, Japan. American Mineralogist: 56: 1507-1518 Am.Min. :67:90 (1982); Acta Cryst. B36(1980). Onac, B.P., et al. (2006). American Mineralogist: 91: 1927-1931. Koděra P., Uher P., Ozdín D., Kollárová V., Lexa J., 2009: Monticellit, clintonit a hydroxylellestadit-fluorellestadit: vzácne skarnové minerály na Cu-Au porfýrovo-skarnovom ložisku Vysoká – Zlatno (štiavnický stratovulkán). Mineralia Slovaca, 41, 2, 169-178.; P. UHER, P. KODĚRA, T. VACULOVIČ (2011): Perovskite from Ca-Mg skarn-porphyry deposit Vysoká – Zlatno, Štiavnica stratovolcano, Slovakia. Mineralia Slovaca, 43, 247-254. Środek, D., Juroszek, R., Krüger, H., Krüger, B., Galuskina, I., & Gazeev, V. (2018). New Occurrence of Rusinovite, Ca10 (Si2O7) 3Cl2: Composition, Structure and Raman Data of Rusinovite from Shadil-Khokh Volcano, South Ossetia and Bellerberg Volcano, Germany. Minerals, 8(9), 399.